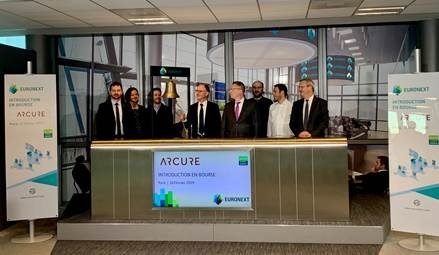 Euronext today welcomed Arcure, a company that harnesses artificial intelligence to create customised image processing solutions for industry, to its Euronext Growth market. At the listing ceremony, Patrick Mansuy, Chairman of Arcure’s Supervisory Board, said: "We are proud to be joining Euronext Growth today. Listing is a milestone in Arcure’s growth and will give us the resources we need to grow, in particular on international markets. We would like to extend our warm thanks to the institutional and individual investors who have demonstrated their confidence in our future by taking part, and also to our existing investors who have renewed their support."